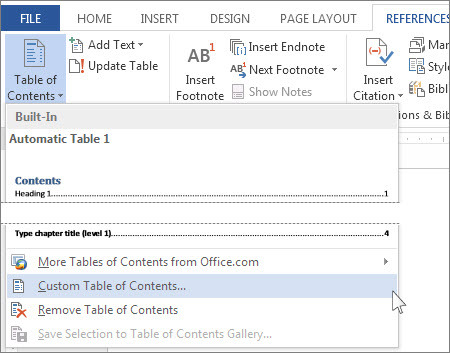 For basic instructions on customizing a table of contents, see Change the layout of your table of contents below. Here are some other ways you can edit your table of contents. Tip: "Levels" in this context refers to your heading levels. You may have Heading 1 for your major headings then Heading 2 for your subsections of those headings. You can have even more sub-levels within those that in your table of contents if you choose. 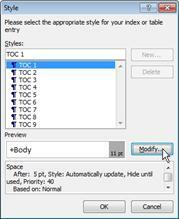 In the Table of Contents dialog box, click Modify. If the Modify button is grayed out, change Formats to From template. 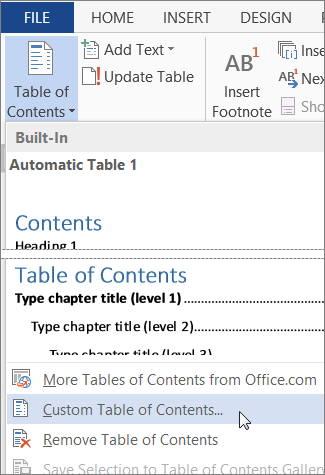 Word will remember these customizations each time you update the table of contents in this document. To change the level of an entry in your table of contents, just change the heading level of that text in the body of your document. Click the heading that you want to change. On the Home tab, in the Styles group, click the heading level you want. On the References tab, click Update Table. Click Update entire table, and then click OK. 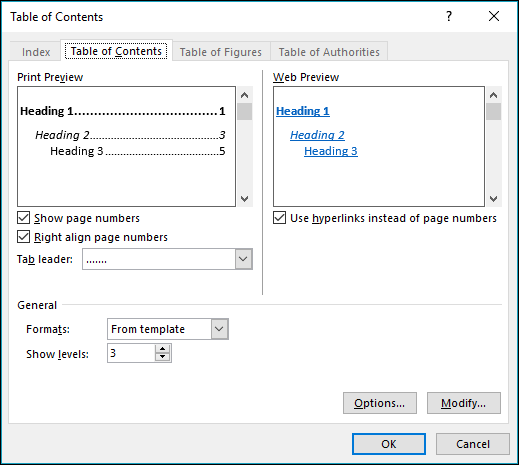 If you’ve already added a table of contents to your document, the following procedure will replace it with a new table of contents that contains the same information and has dot leaders, or dotted lines, between the entries and the page numbers. Click References > Table of Contents > Custom Table of Contents. 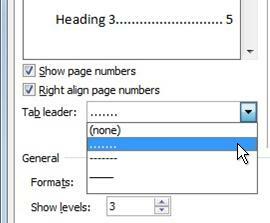 In the Table of Contents dialog box, in the Tab leader list, click the dotted line option. 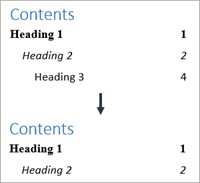 To change the number of levels shown in your table of contents is to replace the existing table with one that contains the levels you want. A shorter, but more technical way to do it is to edit the field code information. 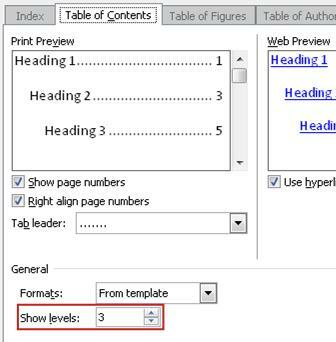 In the Table of Contents dialog box, in the Show levels list, choose the number of levels that you want, and then click OK.
For example, if you click 2, then all text with the Heading 1 style or the Heading 2 style applied is displayed in the table of contents. When you are asked whether you want to replace the existing table of contents, click Yes. Word inserts fields automatically when you use particular commands. 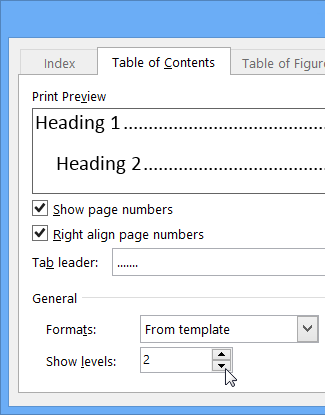 For example, when you Add page numbers, Word inserts the Page field. 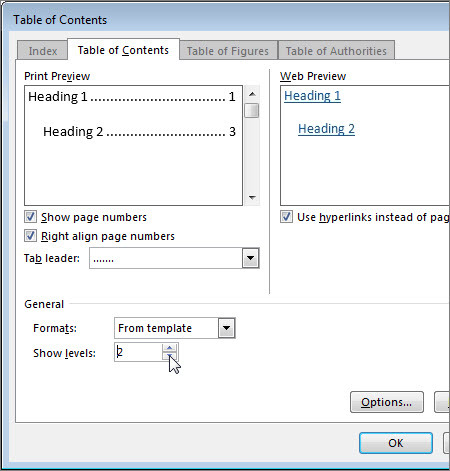 When you Create a table of contents, Word inserts the TOC field. You can edit the field code information to quickly change the number of levels shown in your TOC. Change the numbers in the quotation marks. For example, if you want to show only two levels, change "1-3" to "1-2". Press Alt+F9 to display the table of contents again. Update the table of contents to see your changes (References > Update Table). If you’d like to learn more about field codes, read Field codes in Word. 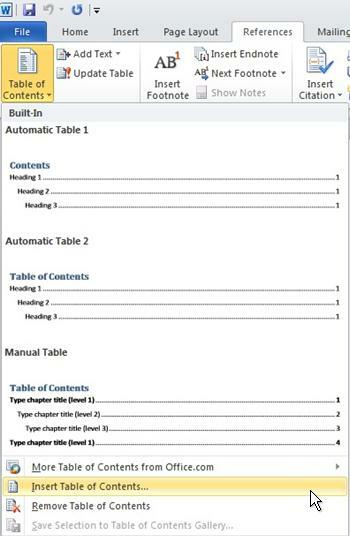 For basic instructions on editing a table of contents, see Insert a custom table of contents below. 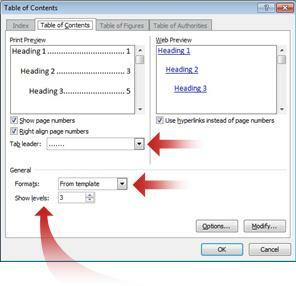 If your document already includes a table of contents, this procedure will replace it with your customizations. On the References tab, in the Table of Contents group, click Table of Contents, and then click Insert Table of Contents. The Table of Contents dialog box opens. To add a dot leader, or dotted line, between each entry and its page number, click the Tab leader list and then click the dotted line. You can also choose a dash leader. You can see what the different formats will look like in the Print Preview box. To change the number of levels that are displayed in your table of contents, click Show levels, and then click the number of levels that you want to show. Here are some more ways you can edit your table of contents. Choose an option from the list below for step-by-step instructions. 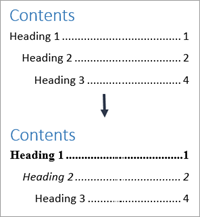 To change the formatting of the table of contents that Word generates, you need to change the style for each level in the table of contents. 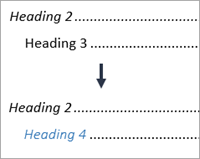 This is separate from the styles that you applied to the headings in your document. 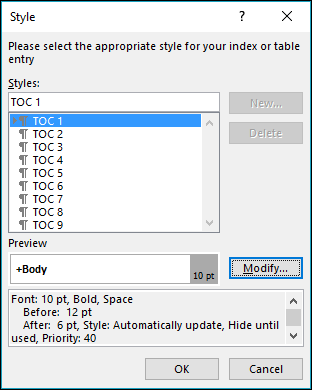 After you make the changes you want to the style, Word uses that style each time it updates the table of contents. 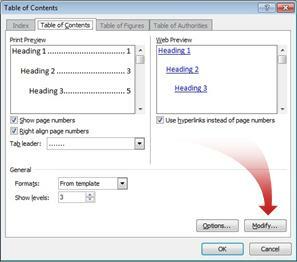 In the Table of Contents dialog box, click Modify. In the Styles list, click the level that you want to change, and then click Modify. On the Home tab, in the Styles group, click the heading style that corresponds to the level you want. On the References tab, in the Table of Contents group, click Update Table. Click Custom Table of Contents. In the Table of Contents dialog box, in the Show levels list, click the number of levels that you want in your table of contents. Do you have a question about Word that we didn't answer here? Post a question on the Word Answers forum. 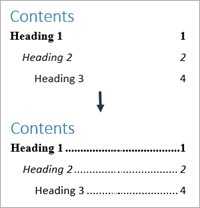 Do you have suggestions about how we can improve tables of contents (or any other feature) in Word? If so, please visit Word User Voice and let us know!